Ramen Tatsunoya, which has 14 shops in Japan, launched their first U.S. store in the heart of bustling Old Town Pasadena on Fair Oaks Avenue. Up until this point, they had only been doing pop ups at the Mitsuwa market or the Ramen Yokocho Festival at Santa Anita Park, building up buzz. 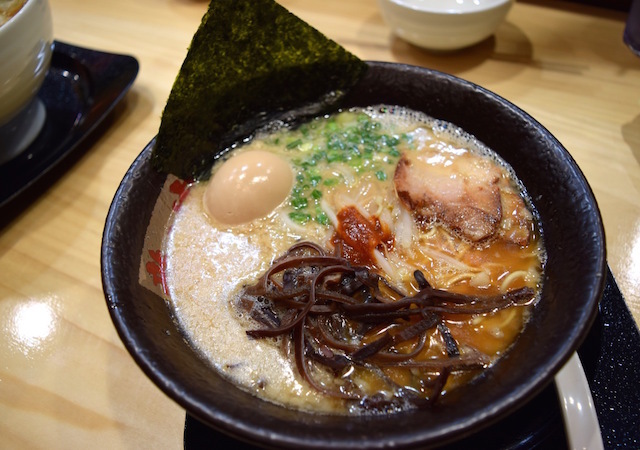 LAist was invited to check out Tatsunoya&apos;s ramen just before its opening. What you can expect from the restaurant are three different types of ramen bowls, of the tonkotsu and spicy miso tonkotsu broth varieties. What makes their tonkotsu broth different is instead of simmering your average pig bones, they slow cook pig-head bones in water for 15 hours. Mikitaka Nagamatsu, the president of Tatsunoya USA, tells LAist that this creates a milder flavor in its milky tonkotsu broth, one that doesn&apos;t taste as fattening and doesn&apos;t have a smell that you can get from simmering other bones. "It&apos;s refreshing," he says. Also, they use tare—the seasoning in ramen—that comes directly from Japan; Nagamatsu says you can&apos;t get that in the United States. They also import soy sauce from Japan. Of the three ramen options, which you can also get with extra chashu meat, we found the Koku Tonkotsu to be our favorite. 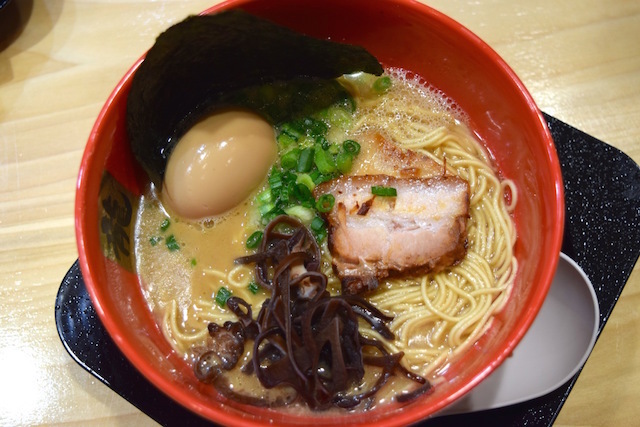 It has the milky and complex tonkotsu broth but with an added intense garlic flavor. As proof, you can see minced garlic bits floating in the broth. It comes with a dollop of red spice, though it only adds to the flavor and isn&apos;t spicy at all. The bowl is filled with your basic additions like sliced green onions, bean sprouts and slices of wood ear mushrooms. And it also has a couple of slices of their juicy and well-marinated, smoked, aburi chashu pork. Some bites of the fatty pork will melt in your mouth. Missing from all the ramen bowls are the flavored soft-boiled egg and dried seaweed, which you can purchase for an extra $1.50 each. We recommend doing this if you want the full experience. The Jun Tonkotsu is similar to the Koku Tonkotsu except it&apos;s missing the garlic and added red spice. So, if you&apos;re looking for something with a milder flavor, that&apos;s your best bet. 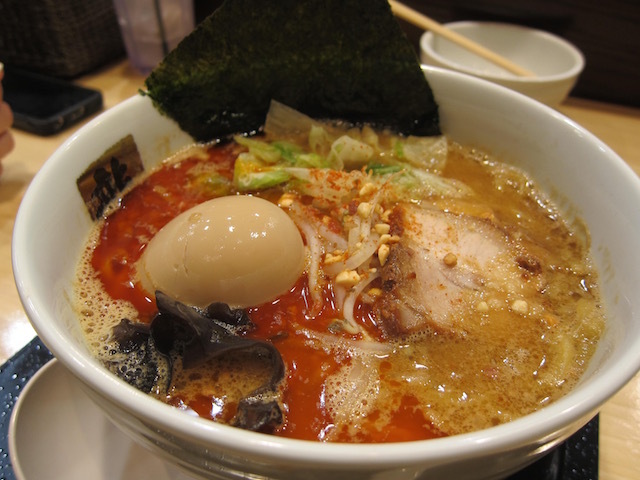 They also offer the Spicy Miso Tonkotsu, which is the most different from all the three bowls. It comes with thicker noodles and cabbage, which gives it a earthier taste, and full pieces of wood ear mushroom. The spicy miso paste also gives it a nice kick and color to the bowl. Tatsunoya also offers some appetizers, from chashu bowls to gyoza. 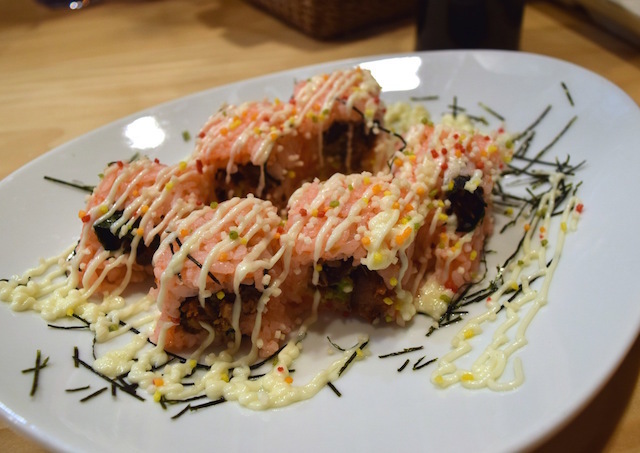 However, something different to try is their Tatsunoya Roll, which are rolls filled with their aburi chashu and topped with fish roe and covered in Kewpie mayo. It&apos;s a beautiful presentation with small strips of seaweed adorning the plate, but more so, it&apos;s a tasty one and refreshing change in the concept of rolls. 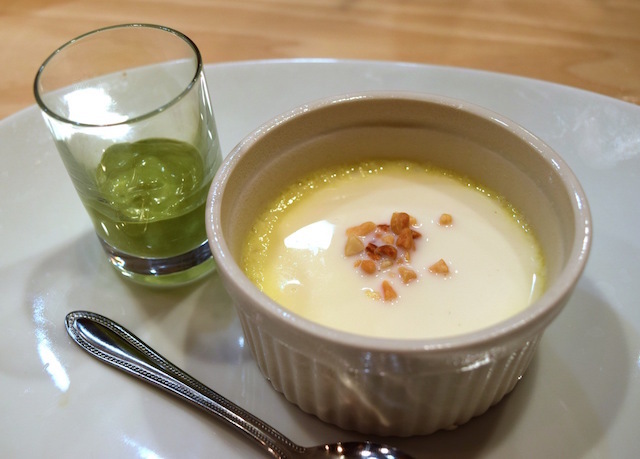 If you have room for dessert, they offer one kind: a silky coconut flan with a side of whipped and light matcha green tea. The bitterness of the tea complements the sweetness of the flan, and the texture is as silky as the name of the dish promises. The restaurant—which has a casual design with brick walls, exposed wooden beams, a ramen bar circling the kitchen and a tree that rises up from a center table to the ceiling—also plans on offering beer and sake soon to go along with their meals. They&apos;ll also be open on Christmas Day if you want to get your slurp on as a present to yourself. 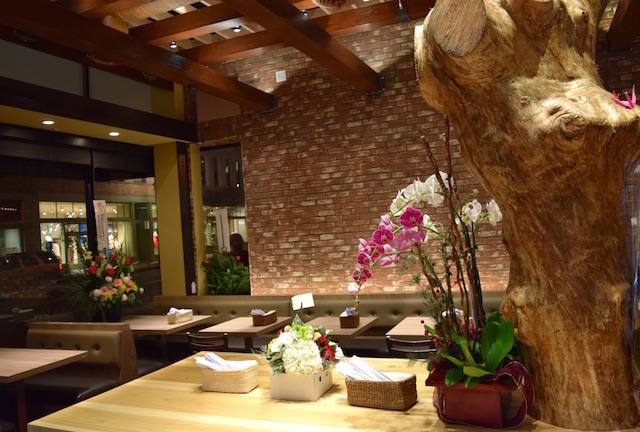 Ramen Tatsunoya is located at 16 N. Fair Oaks Ave, Pasadena, (626) 432-1768. From Dec. 23 to Dec. 25, they&apos;ll be open from 11 a.m. to 2 p.m, and 6 p.m. to 10 p.m. Beginning Dec. 26, they&apos;ll be open from 11 a.m. to 3 p.m. for lunch, and from 6 p.m. to 11 p.m. to dinner. They&apos;ll be open on Dec. 31 for just lunch from 11 a.m. to 3 p.m., and will be closed on Jan. 1. Appetizers and dessert range from about $4 to $9, and ramen from about $10 to $16.